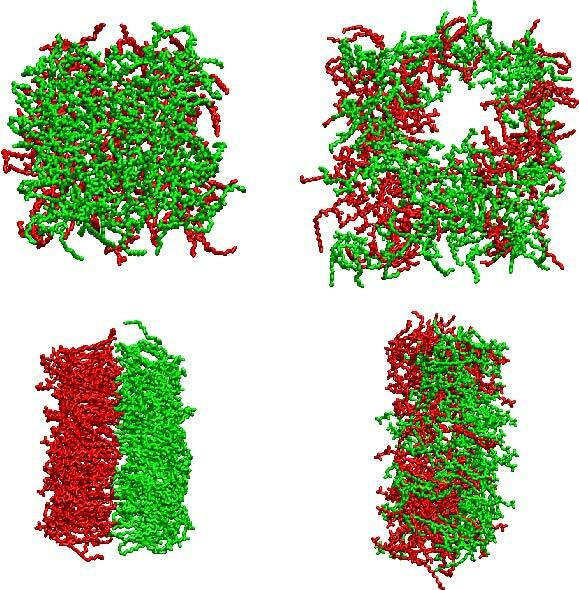 A double bilayer system with the salt-free water reservoir between the two bilayers, and the “outer” water reservoir with NaCl salt (sodium and chloride ions are shown by red and green spheres, respectively). Shown is the final structure after 50 ns of MD simulations. A snapshot of a double PC/PS- bilayer system in aqueous solution with Na counterions after 100 ns of MD simulations. Shown are POPC lipids (head groups in lime, and acyl chains in green), POPS lipids (head groups in red, and acyl chains in orange), water (blue), and sodium ions (yellow). A snapshot of an asymmetric POPC/POPE membrane with phosphate groups (blue), choline groups (yellow), amine groups (cyan), POPC acyl chains (orange), POPE chains (green), and water (red). 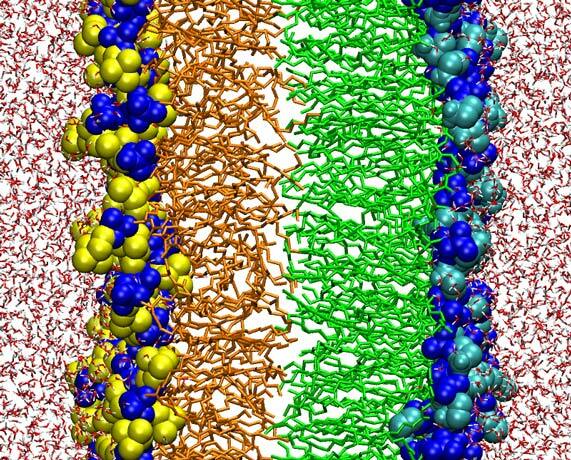 Flip-flop induced mixing up of the lipids which belong to the opposite leaflets of a DMPC bilayer system with KCl salt: (left) Intact membrane at t = 0 ns, and (right) the same membrane with an opened pore at t = 200 ns. 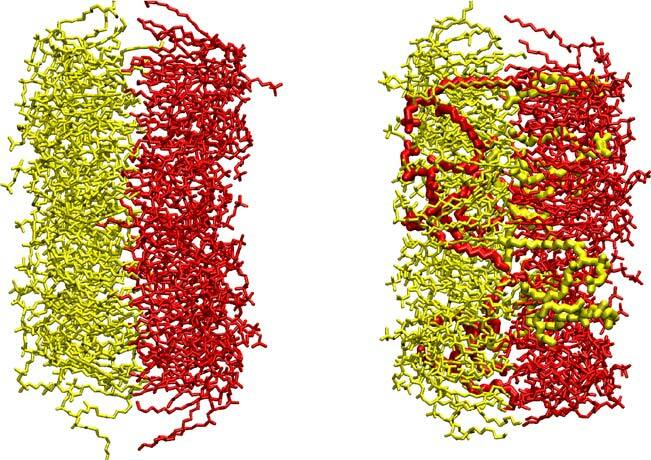 Lipids in opposite leaflets are shown in yellow and red; for clarity the size of flip-flopped lipids has been enlarged. 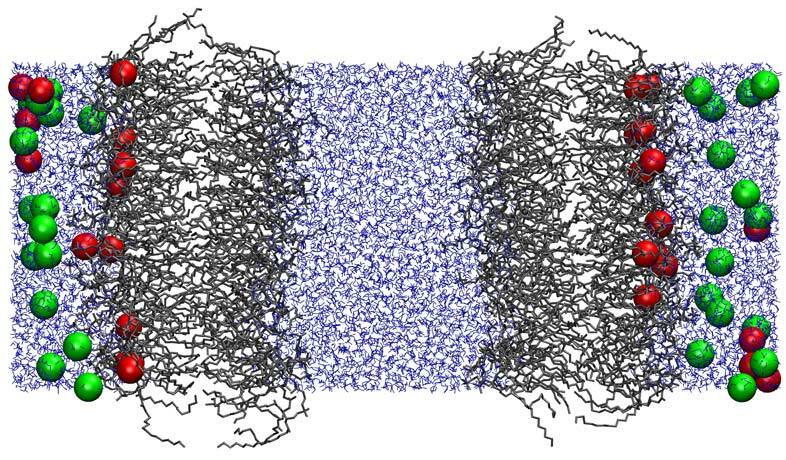 DMSO-induced lipid flip-flops: A DPPC membrane in water with 7 mol % DMSO at T = 323 K at t = 0 ns (left) and t = 100 ns (right). Shown are membrane snapshots, top view (top) and side view (bottom). Lipids in opposite leaflets are shown in red and green. 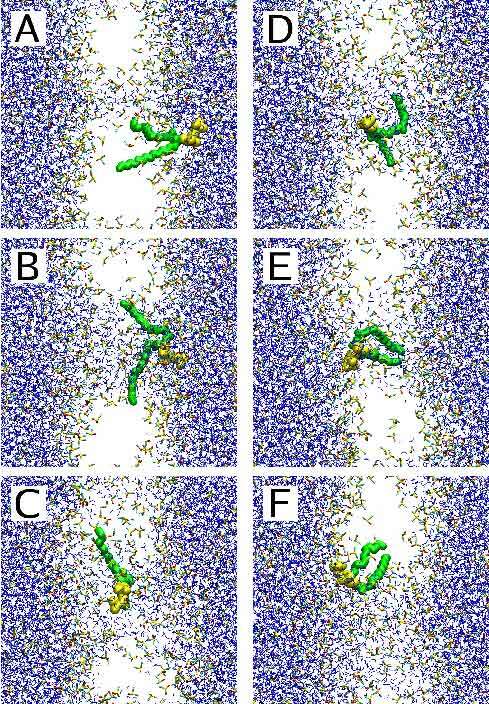 DMSO-induced translocation of a lipid across a DPPC membrane: (A) 42500 ps, (B) 51400 ps, (C) 56950 ps, (D) 62150 ps, (E) 65650 ps, (F) 76750 ps. Lipids (except for the flip-flopped one) are not shown; water is shown in blue, DMSO molecules are shown in bond representation and coloured in red-yellow-cyan, acyl chains of the flip-flopped lipid are shown in green, and its head group in yellow. 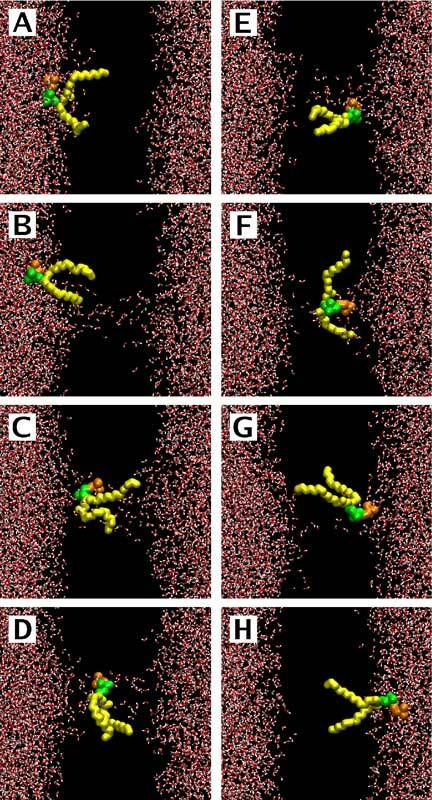 Pore-mediated lipid translocation across a DMPC membrane in aqueous solution with NaCl: (A) 0 ns, (B) 43.85 ns, (C) 118.9 ns, (D) 122.4 ns, (E) 152.7 ns, (F) 204.65 ns, (G) 208.9 ns, and (H) 215 ns. Lipids (except for the flip-flopped one) and ions are not shown; water is shown in red-white, acyl chains of the flip-flopped lipid in yellow, and its choline and phosphate groups in orange and green, respectively.